Edward G. Chekan, a speaker at the marcus evans Medical Device Manufacturing Summit Fall 2013 and the Medical Device R&D Summit Fall 2013, on how device manufacturers and those delivering patient care must collaborate. There is an educational gap in surgeons’ knowledge of how medical devices interact with tissues, says Edward G. Chekan, Medical Director, Medical Education, Ethicon, Inc. a Johnson & Johnson Company. “This gap must be formally addressed, through collaboration between medical device manufacturers and those delivering healthcare. 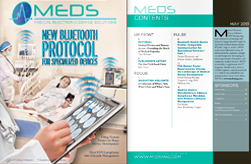 Collaboration between physicians and industry along the length of the product development pathway from clinical problem identification through training on the safe and effective use of the device helps lead to improvement in patient outcomes,” he explains. What knowledge gap exists in surgical training today? How did it come about? There is an educational gap in the knowledge base of surgeons regarding their understanding of how modern medical devices interact with tissues and this gap has not been formally addressed by the medical educational system. Medical device manufacturers can help to fill this void by leveraging their understanding of the design and manufacturing of a specific device. What will fill this gap? Training and educational programs? Educational programs that are created and delivered by collaboration between medical device companies and physicians or academic organizations will most effectively fill this void. The most current and relevant information about the design and use of a new medical device comes from the manufacturer. Manufacturers should consider the strategy for “educational program design” around a new device currently with a “product development design”. What will this lead to? What commercial benefits would this collaboration result in? More collaboration leads to better patient outcomes. Better patient outcomes can be realized if end users merely learn how to most safely and effectively use the devices that they already have. The more patients that are benefited by the device, the better off the patient, the surgeon and manufacturer. More collaboration also leads to the development of new products that will fix the problem that needs to be fixed. When a design engineer is asked to design a new product, they should ask themselves these questions before diving into design solutions: What clinical problem will this new device solve? Do patients need this problem to be solved? How are we going to educate the end user on the safe and effective use of this product?